Children’s bedrooms are where the sandman and the tooth fairy come to play, while the little kiddies catch their forty winks. This may perhaps be the most important part of designing a child-friendly house, as this is where your child starts and ends his or her day. In the bedroom, your child will be hearing bedtime stories, reading books, or staying up late playing with handheld gaming consoles, while you think the little tyke is asleep. Most importantly, this is where he or she will be getting some much needed rest after a long day of playing or at school. This time, you’ll learn how to design and furnish a child’s bedroom. Take note that it’s always better to personalize this part of the house since the bedroom is his or her little sanctuary, and needs to fit your child’s tastes. Why should you design your kids’ bedroom? Children learn from their environments, and require an environment that’s constantly conducive to learning. You should make the bedroom extra special and personalized because this is your child’s special place, and he or she will be doing a lot of learning in their room. The bedroom should reflect your child’s personality, or at least how you want them to be. Let child live out and express his or herself in the bedroom. Tips on designing a child’s bedroom: 1. Don’t be too dreary. Stimulate the child’s imagination. 2. If only one kid is going to use the room, you won’t need one that’s too roomy. Give just enough space for the bed, a closet, and a little extra for him or her to play and move around. 3. Consider your child’s interests. Allow him or her to have a bookcase, some toys, or even musical instruments in his or her room. Always keep this in mind when designing the. 4. If you’re raising a baby, keep the room close to your bedroom, and choose a crib over a bed to keep the infant from rolling over and falling. We will have tips on choosing your child’s crib further on. 5. Make sure there’s enough lighting in the room. Children also need their fair share of comfortable, soft and style forward furniture, especially since your children are still growing and their bones aren’t as strong as yours. You will need to make sure that your children are able sit and lie down on furniture comfortably and that it instills proper posture and at the same time, keep them well-rested and relaxed. Children’s bedrooms don’t require a lot of furniture except their beds. You may opt for double-bunk bed depending on your needs. 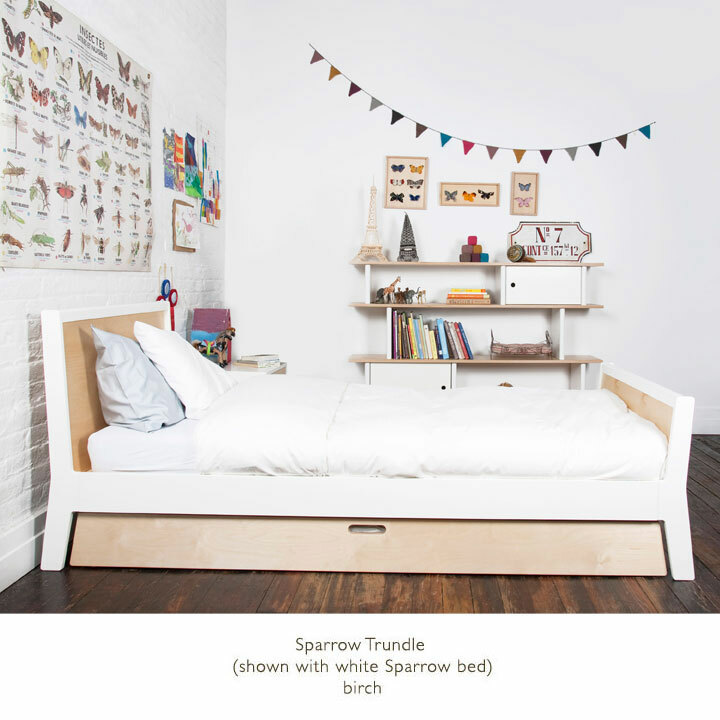 A great choice would be the Oeuf Sparrow Twin Bed. Whether you and child only need some more space to roll, jump or play around the Oeuf Sparrow Twin bed is perfect. You may also add on the trundle bed for sleeping room for sleep over’s. It is made of very solid birch wood, but at the same time very simple to assemble. Another necessity would be a bedside table or nightstand to hold a lamp and an alarm clock. Children still need to have their body clocks adjusted. You could also add a desk when your child is old enough to study by him or herself. As mentioned above, make sure that your children’s room is well-lighted. Also, keep the child’s bookcase and other educational materials close to the desk so that there are down time in studying. Having everything in your children’s room will help strengthen their sense of independence and responsibility, as he or she will not only learn, but also will have to keep their room tidy. It’s no secret that infants will love their cribs. The style is really up to you and it really depends on whether you want to keep your style to flow into your child’s room or go against the grain. Remember safety is always the number one reason when purchasing a crib. That why safety standards are so strong it keeps manufactures from using hazardous materials. Remember that the crib you select is where your baby will spends most of his or her time. The amount of sleeping, playing or just amusing his or herself will last about 3 years so choose wisely. You child will not be aware of it, but their personalities and cognitive abilities are being developed in their crib, and will have a strong lasting effect on their childhood, and eventually their adult lives. The main purpose of a crib is to keep your child safe while you’re away, so make sure to check that your choice crib is working for all you and your baby needs. You might opt to use a secondhand crib to reduce expenses, but it’s always safer to buy a brand-new one to ensure that it’s in proper working condition. If it’s too brittle, it might expose your baby to risks of falling and injury. A very popular choice would be the Oeuf Classic Crib. The Oeuf Crib line is known for its simple yet elegant and sturdy creations. Oeuf beds and cribs line are awesome, they are very easy to put together, and is free from lacquers and paints that could harm your little angel. It is also built to stay in place and keep from breaking, with a mattress support for three positions. But if you are a jet setter and think you will still have time to jet set with a baby, you can go for the Babyletto Grayson MiniCrib. It is very versatile, with a feature that allows you to fold it and put it away. If you’re constantly travelling and can’t afford to leave your child behind, you can buy this instead of renting or buying a baby bed wherever you go. This crib comes in different colors. There are a lot of options to go over for quality crib. You could even have them personalized and constructed according to your tastes and needs. Take note though that this option will mean that you’ll be spending a bit more.